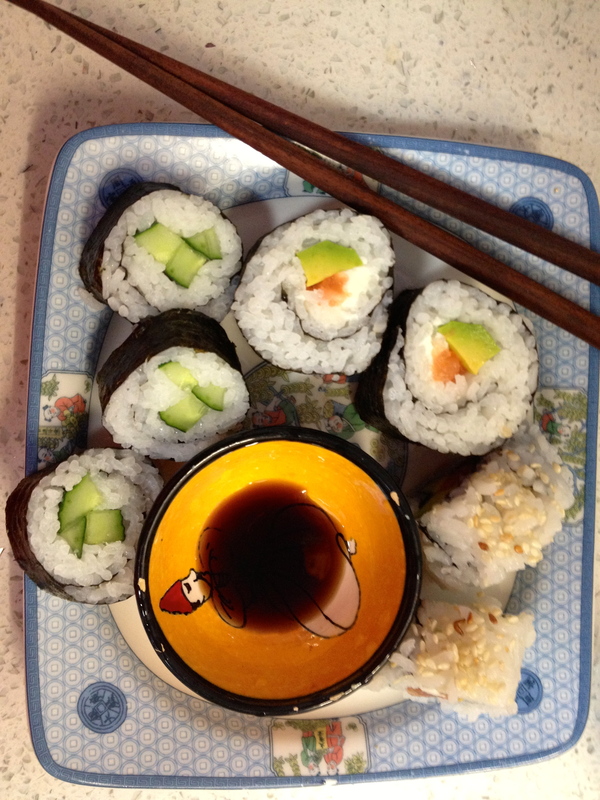 Sushi is made with some common and not so common ingredients and equipment. Great sushi starts with great cooked sushi rice, a combination of small grain, round polished sushi rice, and seasoned with rice vinegar, sugar, salt, and oil. Once the rice is prepared the sky’s the limit as to what ingredients you can include into your luscious rolls of sushi. Combinations of finely sliced vegetables, raw fish, and other condiments are wrapped with Nori, the thin sheets of dried seaweed, and sliced into beautifully formed and appetizing rounds. Dipped into a soy sauce and wasabi mixture and eaten using chopsticks, these healthy morsels can be the appetizer or an entire meal for lunch or dinner. Place the rice into a strainer or colander in a mixing bowl and cover with cool water. Swirl the rice in the water, pour off and repeat 2 to 3 times or until the water is clear. 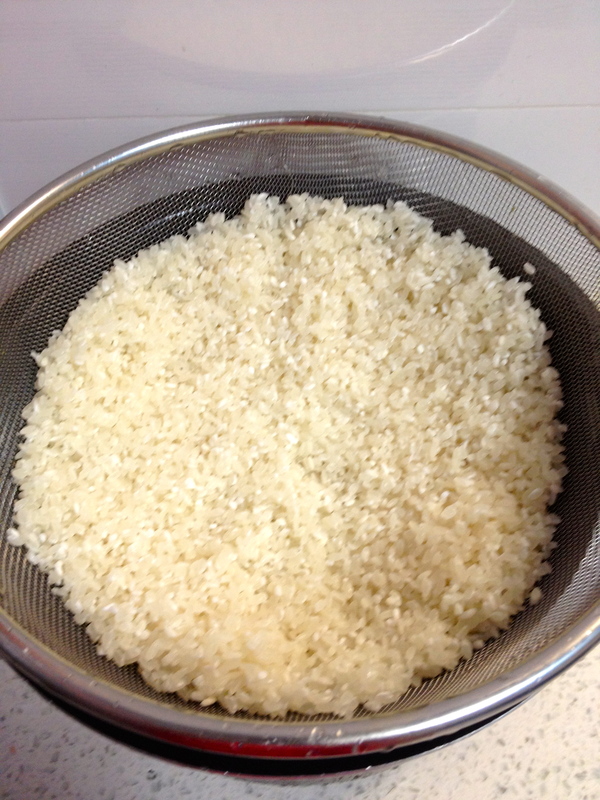 Let the rice sit for 30 minutes to allow the rice to absorb the water and therefore be tender. Place the rice and water into a medium saucepan or a rice cooker. Stove Top Method: Bring to a boil, uncovered on high heat. Once it begins to boil, reduce the heat to the lowest setting and cover. Cook for 15 minutes. Remove from the heat and let stand, covered, for 10 minutes. 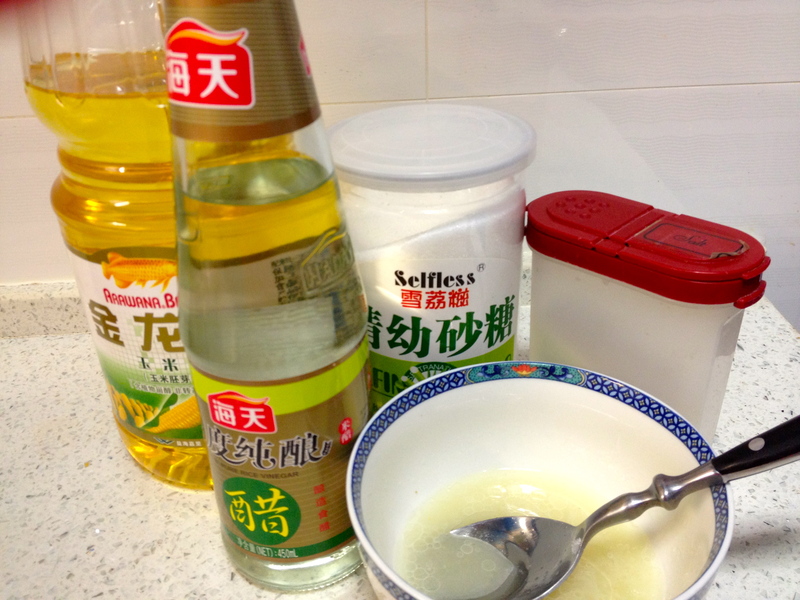 Mix the rice vinegar, sugar, salt and oil in a small bowl and place in a microwave on high for 30 to 45 seconds. 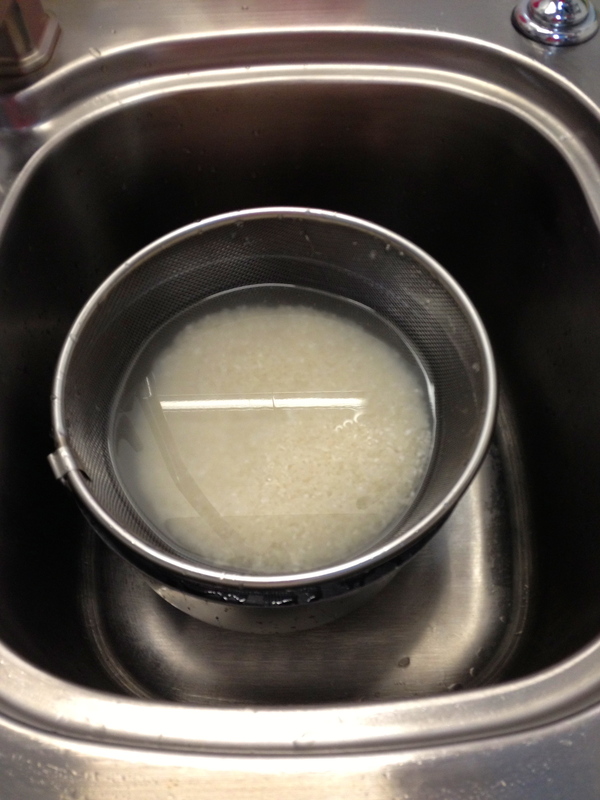 Put the rice into a large wooden or glass mixing bowl and add the vinegar mixture. Use a wooden spoon and fold thoroughly to combine and coat each grain of rice with the mixture being careful not to damage the rice. 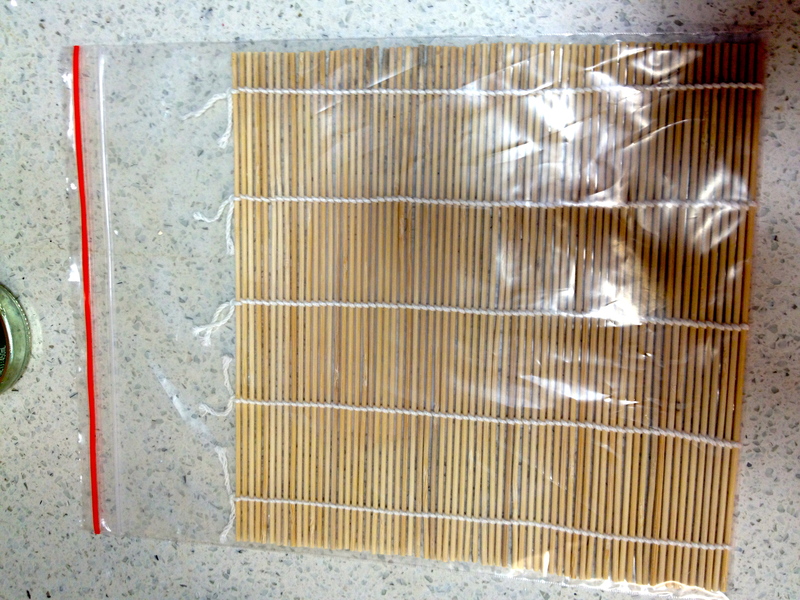 Allow the rice to cool to room temperature before using to make sushi or sashimi. Your ingredients must be prepared before you can start to put your sushi rolls together. Prepare your fresh ingredients while the rice is cooking and cooling. Fish ingredients should be slightly frozen to cut easily into thin strips. Leave the skin on the cucumber. Use the whites and green parts of green onion. Peel carrots and cut into long thin slivers. So the rice doesn’t stick to the bamboo sushi mat, wrap it in cling film or better, place it inside a ziplock baggie, letting out the air before sealing. Place one sheet of nori on the mat with the long sides left and right of your surface and the short sides on the top and bottom closest to you. Take a tennis ball sized fistful of rice (approximately 1 cup, well packed) and spread it out on the nori. Do not go right to the edges, leaving an 1/8 of an inch on the sides and bottom and leaving a ½ space on the short side at the top of your mat, farthest away from you. Press firmly to even out the rice, using the back of a wooden spoon, which doesn’t stick to the rice. Dab a line of water on the nori where there is no rice at the top end. * NOTE: The nori can be placed on the mat with the long sides in front and the short sides to the left and right…it’s your choice. The difference is only in the size and the quantity of rolls you will get at the end. At about the 1/3 mark from you, line up the ingredients parallel to you. Try not to leave any space on the line. Begin to roll, in jelly roll fashion, from the end closest (and shortest) to you using the mat and putting firm pressure on the ingredients until the mat is just around the entire ingredients. Then pull the nori and the mat closer to you, but removing the mat from above the ingredients and placing it all the way around the ingredients, rolling as you go. Press down firmly to push the ingredients firmly in place. Repeat one more time to attach the nori to the other end of the nori to seal the ends together. A little more water may be required to seal the ends. Keep a damp clean cloth beside you to keep your workspace and your hands clean. Move the roll down and to the side edge, and wrap the mat around, pushing any stray bits back into the end with the flat end of your knife. Repeat with the other end, for a clean end. Lightly mark the half-way-point with your knife, easily finding the middle point by lining the roll inside the ropes that hold the mat together. Remove the roll to a cutting surface. Using a well-sharpened knife, cut through the centre where you marked it. Turn one of the pieces around to line up with the other clean-cut end. Clean the knife after each cut by dipping it in cold water and wiping with your clean cloth. Sharpen again as required. The more you sharpen, the better your cuts. Cut the two pieces at two time, into half, and then half again, making taller, or shorter pieces of sushi. Cutting in thirds will make taller pieces of sushi, cutting in fourths will make shorter pieces, the amount of cuts depending on how tall you want your sushi to be. Place the amount of rice on your nori as above, making sure the rice is firmly on the nori. At the 1/3 line sprinkle a row of sesame seeds. Turn the nori with the rice over onto your mat and repeat as above. The sky’s the limit; only limited by your own imagination. Give this healthy food a try and let me know how you do. 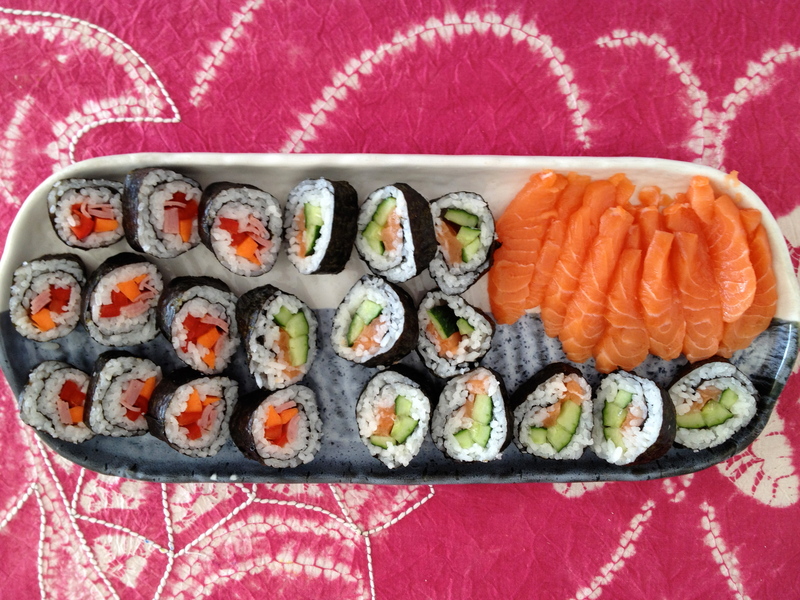 Do a Google search for more information and videos on how to roll sushi and enjoy!